The USD Apocalypse of September 30, 2016? A reader asked me today if I knew anything about a forecast of an imminent US Dollar Apocalypse of September 30, 2016. After digging around, I found this article on Daily Reckoning. It turns out that the Chinese RMB is going to get included in the Special Drawing Rights (SDR) basket of currencies as of 4pm on Friday, September 30, 2016. The weight of CNY is going to be 10.9%, which is higher than the weight of the Japanese Yen at 8.3%. The story of RMB inclusion in SDR is another nail in the coffin of King Dollar. 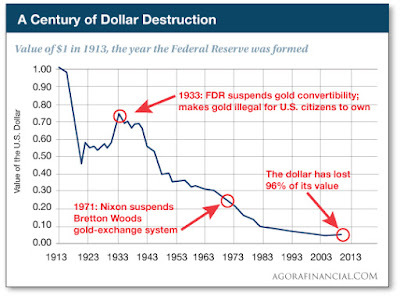 The article then went on to reiterate the thesis about the destruction of the USD as a store of value. 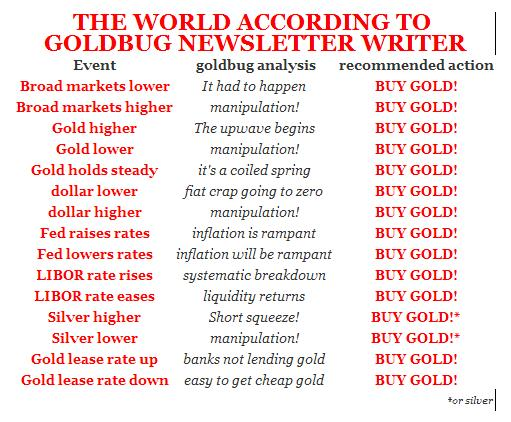 The obvious solution is, of course, to buy gold. Oh, PUH-LEEZ! Sorry to disappoint the goldbugs, but some simple calculations show that gold to be an inferior investment to a USD cash position if we factor in T-Bill interest payments. The full post can be found at our new site here. Mid-week market update: From a trader`s perspective, this market had been jittery and mainly driven by two themes. The first was the resolution of the uncertainty over the presidential debate that occurred Monday night. The other is the uncertainty over the fate of Deutsche Bank as a symptom of the systemic risk posed by European financials. The market reactions to these themes can hold clues to short-term market direction. 'She will have to answer every single question flawlessly, exude gravitas...not cough, wear an acceptable pantsuit, smile enough, be likable, not laugh and have a good hair day. Donald Trump will just have to show up,” said an Ohio Democrat. I have no idea of who might come out on top, or who will be the next president of the United States. Given the low expectations for a Clinton victory in the debates, here are some stocks with a common theme that could benefit should HRC perform well in the debate. We maintain several market timing models, each with differing time horizons. The "Ultimate Market Timing Model" is a long-term market timing model based on the research outlined in our post, Building the ultimate market timing model. This model tends to generate only a handful of signals each decade. The Trend Model is an asset allocation model which applies trend following principles based on the inputs of global stock and commodity price. This model has a shorter time horizon and tends to turn over about 4-6 times a year. In essence, it seeks to answer the question, "Is the trend in the global economy expansion (bullish) or contraction (bearish)?" My inner trader uses the trading component of the Trend Model to look for changes in direction of the main Trend Model signal. A bullish Trend Model signal that gets less bullish is a trading "sell" signal. Conversely, a bearish Trend Model signal that gets less bearish is a trading "buy" signal. The history of actual out-of-sample (not backtested) signals of the trading model are shown by the arrows in the chart below. Past trading of the trading model has shown turnover rates of about 200% per month. The performance chart and model readings have been delayed by a week out of respect to our paying subscribers. Update schedule: I generally update model readings on my site on weekends and tweet any changes during the week at @humblestudent. Subscribers will also receive email notices of any changes in my trading portfolio. Recently, there have been numerous reports on the unsettled macro and market environment as a result of the US presidential election. 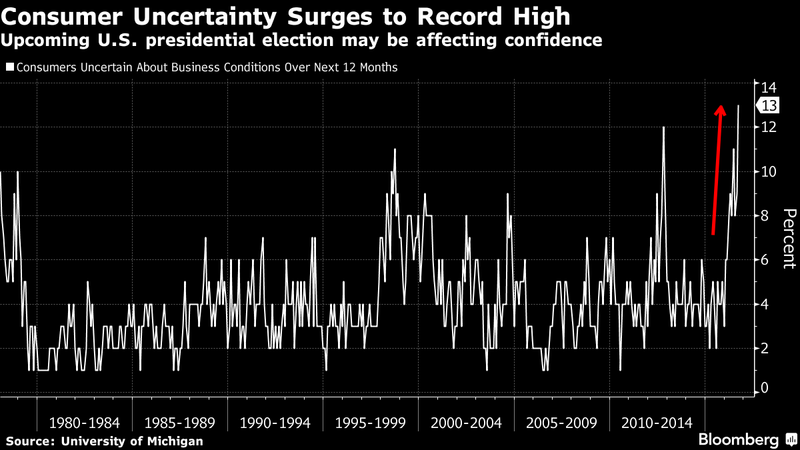 Bloomberg reported that consumer uncertainty had spiked. 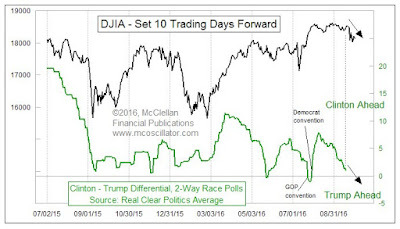 Tom McClellan also identified a rough correlation between the stock market and the polls. The market seems to interpret a rising Clinton lead as bullish and rising Trump lead as bearish. 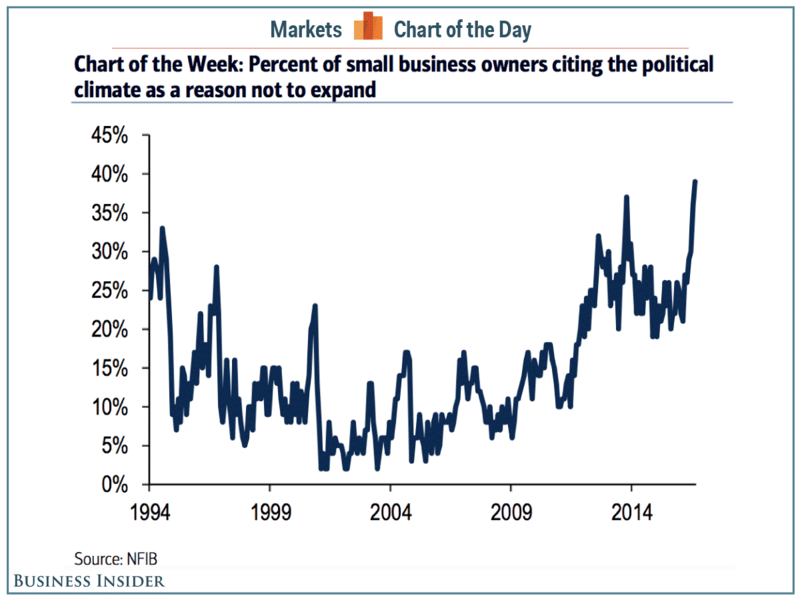 It's time to ask the question, "What is the likely equity market trajectory under a Clinton or Trump presidency?" The Federal Reserve has spoken (see FOMC September statement). With three dissenting votes on the FOMC, a December rate hike is more or less baked in. 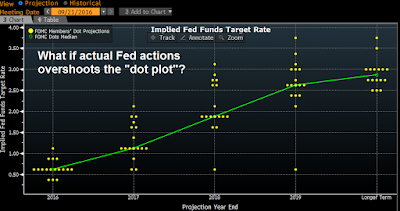 The Fed will take a gradual approach to rate hikes, with the median "dot plot" forecasting a December rate hike and two more in 2017. 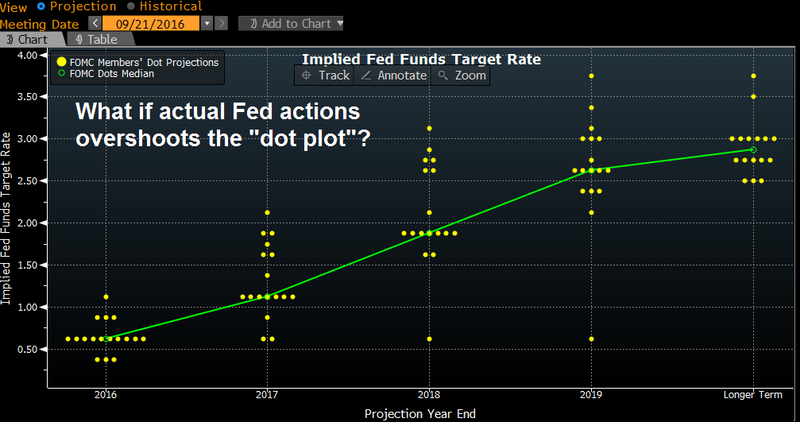 While the market doesn't really believe in the "dot plot" projections anymore, as actual action has consistently been below projections. This time may be different. There is a case to be made that the market is poised for a nasty upside surprise in 2017, where the pace of rate normalization will be higher than expected. Should such a scenario unfold, it would be very bearish for stock prices. Mid-week market update: The world is full of surprises. 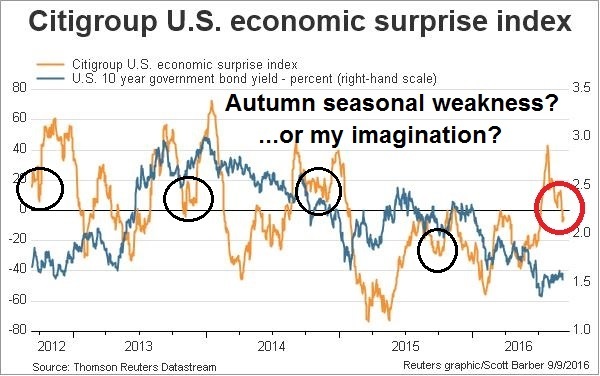 Not only was I beside myself when news of the Bragelina breakup hit the tape, I mistakenly believed that the stock market did not display sufficient fear to form a durable bottom (see the trading comments in Is a recession just around the corner?). 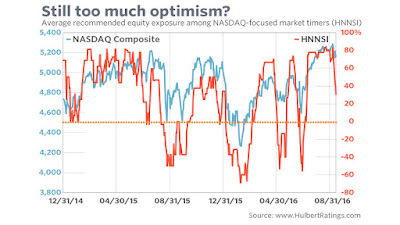 Last week, Mark Hulbert found that the bullishness of his sample of NASDAQ market timers had retreated but readings weren't at a bearish extreme, which suggested that a scenario of more market choppiness. The CNN Money Fear and Greed Index had fallen to levels where the market had bounced before, but it could have gone a lot lower. Even if it were to bottom at these levels, I would not necessarily discount a W-shaped bottom where the index declined to the recent lows before rising again. I was wrong. Life is full of surprises. I live in Vancouver on Canada's west coast. This was the city I grew up in and where I chose to settle after I went into semi-retirement. It's a great town, but property prices are sky high and have become unaffordable for many locals. Some real estate boosters will resort to the standard explanations such as "we've hosted the Winter Olympics" and therefore "it's a world class city". But have property prices gone parabolic in other "world class city" Winter Olympics host cities like Turin, Salt Lake City, Nagano, Lillehammer, Sarajevo, or Lake Placid? I didn't think so. The main reason for the stratospheric prices has been called China's Great Ball of Money and it has rolled into Canadian real estate. 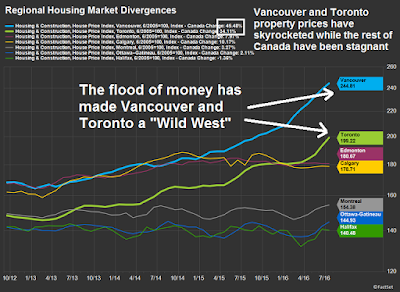 Factset recently documented how residential property prices have skyrocketed in Vancouver and Toronto while the rest of Canada have been flat as Mainland Chinese money has been buying in those two cities. 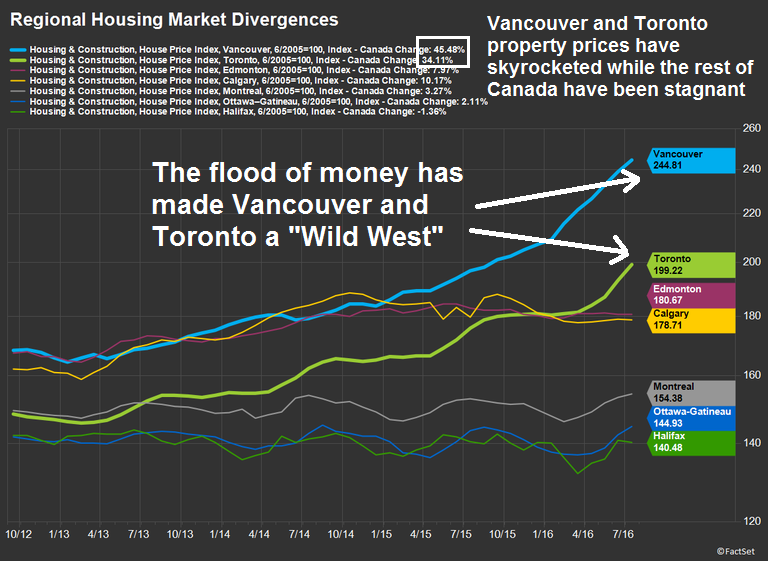 Based on the stories that have surfaced, the flood of money has made the Vancouver and Toronto real estate markets a Wild West (chart annotations below are mine). I am not here to write about how foreign money pouring into Vancouver and Toronto have caused affordability problems for local residents (true, see #HALTtheMadness on Twitter), or how Canadian authorities have turned a blind eye to the problems of money laundering and tax evasion due to offshore money flows (see this SCMP article). This is a post about vulnerabilities posed by the financial linkages between China and the rest of the world (see my previous post How much "runway" does China have left?). What happens if we see a hard landing or banking crisis in China? Is a recession just around the corner? Recently, a lot of US macro economic releases has been coming in a bit on the soft side. 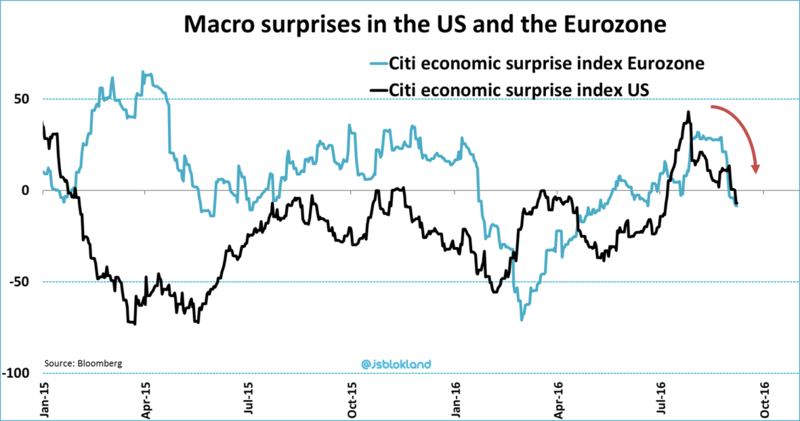 As the chart below shows, stock prices have a high degree of correlation with the Citigroup Economic Surprise Index, which measures whether economic data is beating or missing expectations. As a result, I am sensing a heightened level of anxiety among some of my readers. I have received several requests for comments to the macro post written by Sven Henrich, otherwise known as Northman Trader (Northy). In his post, Time to get real, Part II, Northy laid out the macro view for an impending recession. He correctly pointed out that recessions, which are bull market killers, often occur during the first year of a presidential term. 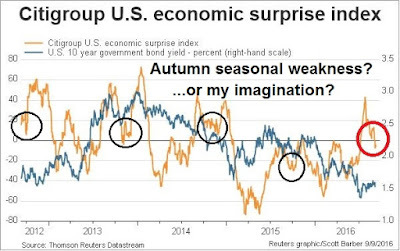 So, with macro data weakening, is a recession just around the corner? In conjunction to my response to Northy's recessionary post, I thought that it would also be timely to review the message from my Recession Watch indicators. Mid-week market update: Did you think that a market bottom was going to be this easy? I got worried on Monday when I received several congratulatory messages and high-fives for my weekend tactical bullish call (see Macro weakness: Just a flesh wound?). That rebound seemed a bit too easy. especially when I saw the latest research report from JPM derivatives analyst Marko Kolanovic. 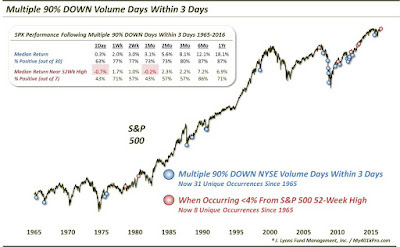 The stock market needs to move only 1% to 2% lower for volatility to dramatically increase to the downside, as highly leveraged strategies could engage in mechanical selling. When markets are pushed to extremes, the snap-back to normalcy can be hard. Kolanovic notes that record leverage in these strategies could push the market lower and volatility higher. The market might not even need a catalyst to increase volatility, seasonality in September and October could do the trick. When the systematic strategies start to deleverage nearly $100 billion in assets could be pulled from the stock market, Kolanovic projected. 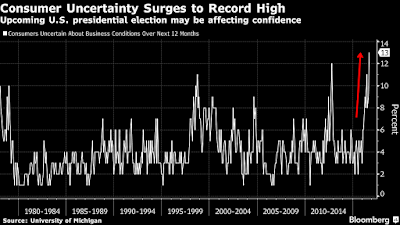 In other words, a number of algo driven strategies, such as CTAs and risk parity funds, got into a levered crowded trade during the period of low volatility. The sell-off on Friday was the trigger for an unwind of that trade. According to Kolanovic, it could be very ugly. There is some good news and bad news for the bulls. 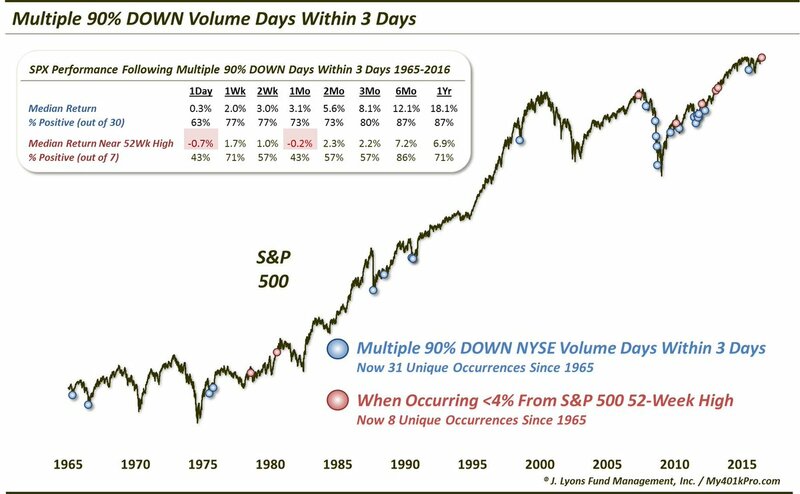 The good news, according to this Dana Lyons historical study, suggests that downside risk is limited at current levels. The bad news is the market is likely to be choppy and volatile for the next few weeks. With that trading environment in mind, I can offer traders a couple of near sure-fire ways of spotting market bottoms. The hawkishness of regional presidents is no surprise. Bloomberg reported that the boards of eight of 12 regional Feds had pushed for a rate hike. The hawkish tone by regional Feds has been offset by more the dovish views of Fed governors. Fed governor Daniel Tarullo told CNBC last week that he was open to rate hikes in 2016, but he wanted "to see more inflation". Today. uber-dove Fed governor Brainard stayed with a dovish tone in her speech stating that the "asymmetry in risk management in today's new normal counsels prudence in the removal of policy accommodation". The market's intense focus of when the Fed moves rates is the wrong question to ask. Rather than ponder the timing of the next rate hike, the better questions to ask is, "What is the trajectory of rate normalization for 2016 and 2017 and what are the investment implications?" 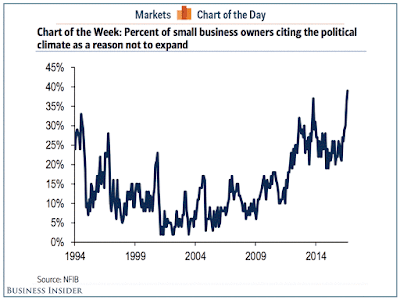 Macro weakness: Just a flesh wound? 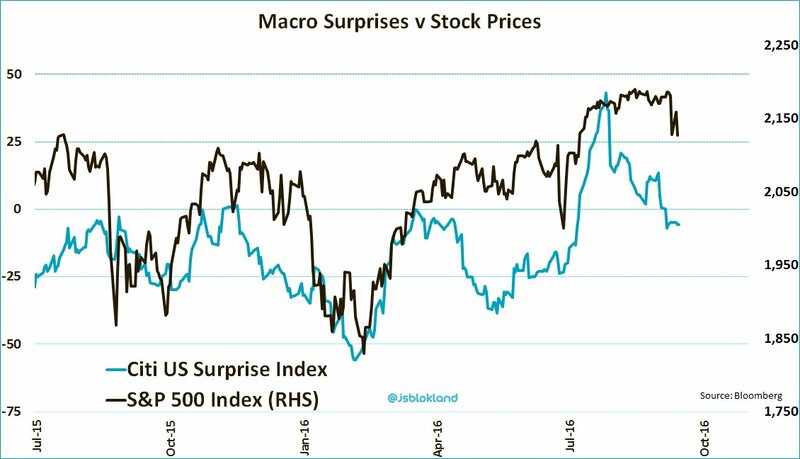 Weak macro = Weak stock market? 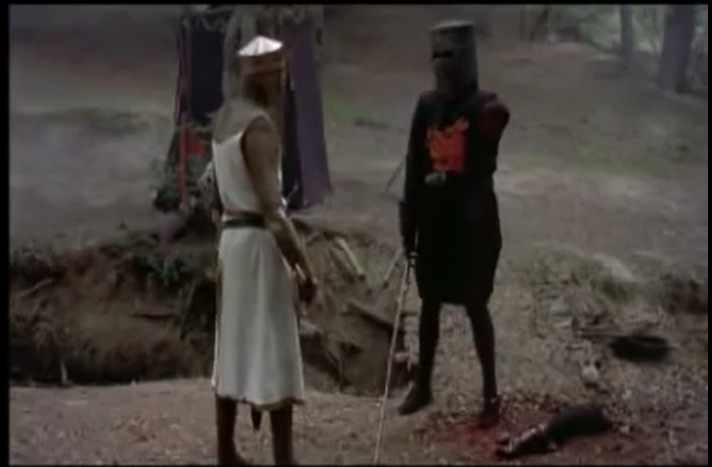 Friday's dismal market action got me thinking about the Black Knight scene in Monty Python's Holy Grail. Did his arm get chopped off, or was it just a "flesh wound"? The macro data had been disappointing even before Friday's market downdraft, which undoubtedly contributed to the slightly sour tone in stock prices. The combination of disappointments in ISM Manufacturing and Services, a so-so Beige Book report, and softness in the Labor Conditions Market Index all contributed to the downbeat macro-economic momentum. 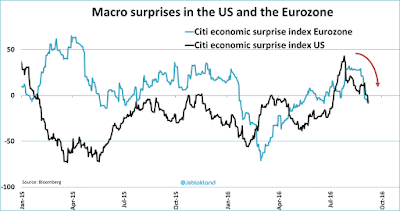 One key indicator of macro disappointment is the Citigroup Economic Surprise Index (ESI), which measures whether high frequency economic releases were beating or missing market expectations. 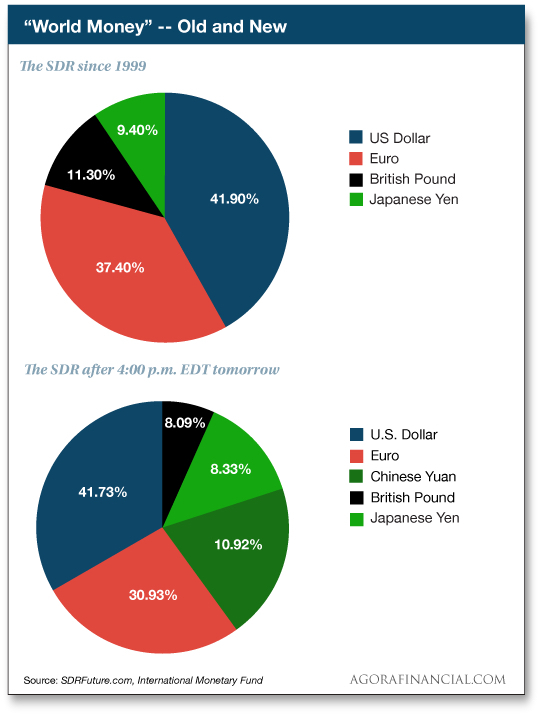 As the chart below shows, ESI has been falling in the past few weeks on both sides of the Atlantic. As a detailed examination of US ESI shows, there may be a seasonal pattern where the ESI weakens in the autumn and then recovers later. Or is that my imagination? A case could be made that the dip in ESI is just a blip. A check of bottom-up fundamental indicators and technical market breadth shows that both of these other dimensions of market health are signaling further stock market gains. For now, I am inclined is to give the bull case the benefit of the doubt. Mid-week market update: Two weeks ago, I had forecast a minor stock market pullback as the SPX neared 2200 (see The market catches round number-itis). The corrective move hasn't happened and remain in a tight trading range. The one bright spot for the bull case is stock prices haven't fallen in response to bad news, such as the surprising shortfalls in both manufacturing and services ISM in the past week. On the other hand, the tight trading range appears to be encouraging traders to short volatility, which is worrisome. 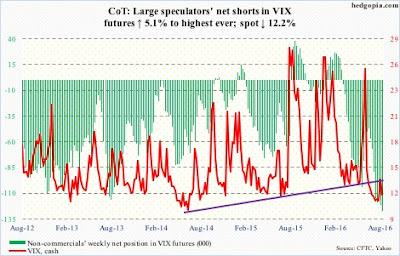 I've become increasingly concerned about a prolonged crowded short reading by large speculators on VIX futures. Here is the chart from Hedgopia. The crowded short position by large speculators is worrisome because it invites a disorderly unwind of the shorts, which would lead to a spike in volatility. As the VIX Index tends to be inversely correlated with equity prices, VIX strength would therefore translate into equity weakness. At the same time, the SKEW Index indicated a heightened appetite for tail-risk protection. 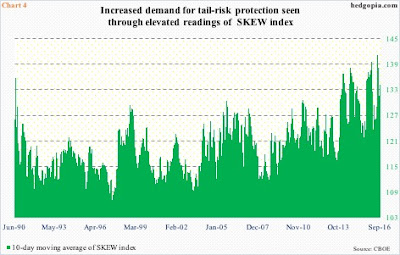 As both my inner investor and inner trader have adopted bullish views, the prolonged period of an extreme net short VIX position was a nagging concern - until I realized the explanation for traders to be short VIX. Using the new analytical framework, these readings did not appear to be equity bearish at all. Thanks, but I'm not that good! It's always nice to get positive feedback from subscribers. One subscriber praised me for my trading model and wanted real-time updates of signal changes (which I already provide but wound up in his spam folder). Another subscriber complimented me on my series of tweets indicating an oversold market on Thursday, which suggested that the market was poised to rally should the Jobs Report on Friday morning was benign (click links to see tweet 1, 2, 3, 4, and 5). Thanks, but I'm not that good. Humble Student of the Markets is not intended to be a trading service. I addressed this issue in my post Teaching my readers how to fish. Deciding on how to execute the trade. If I know nothing about any of those things, how could I possibly know if anything I write is appropriate for you? I was asked recently why I don’t post my portfolios and their performance. While posting my trades represent a disclosure of any possible conflicts in my writing, my own portfolios are a function of my own cash flow needs, my return objectives, my own pain thresholds, etc. How could any portfolio that I post be appropriate to anyone else? A terrific call, or terrible call? Was that a terrific call, or a terrible call? You be the judge. At one level, the call to buy a high-beta portfolio a week before a possible generational bottom for stocks could be a career making call. On the other hand, the market fell -11.9% based on closing prices before the final bottom was reached. For investors, the Phoenix portfolio was well-timed and it went on to roughly triple its value in about a year. For short-term traders, the 11.9% drawdown was a disaster. This brings me to my point. Don't blindly follow what I do. My return objectives are not the same as yours. My pain threshold will be different from yours, which affects the placement of stop loss orders. Your mileage will vary. I can only teach you how to fish, not fish for you. A copy of this post can also be found at our new site here. Here at Humble Student of the Markets, I use technical analysis as a way of measuring market psychology. The combination of price, volume, sentiment, and how the market response to news convey important information about the psychology of market participants. At the same time, I use fundamental and macro-economic analysis to derive information about the drivers of stock prices, such as valuation and the momentum of fundamentals. In particular, fundamental and macro analysis yield clues about how the E in the P/E ratio is likely to evolve. 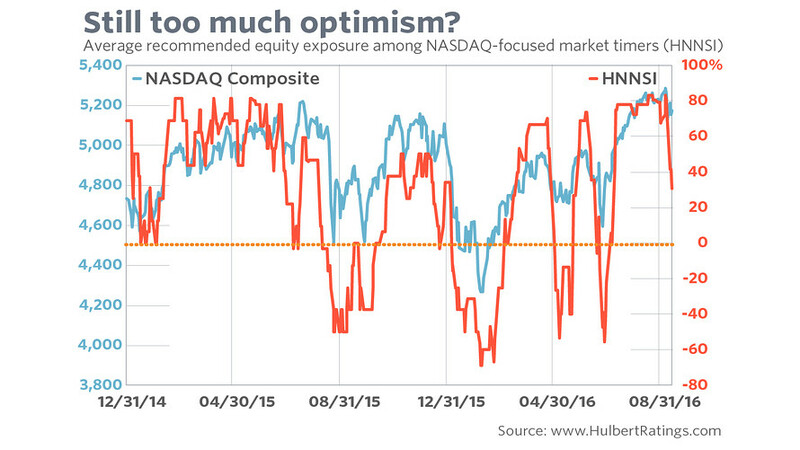 These conditions are indicate a bullish stance on stocks for the remainder of 2016. After that, my crystal ball gets a little cloudy and I will become more "data dependent".